aPaws is a nationwide trade association whose main concern is making sure pet waste is cleaned up from residential and commercial properties. 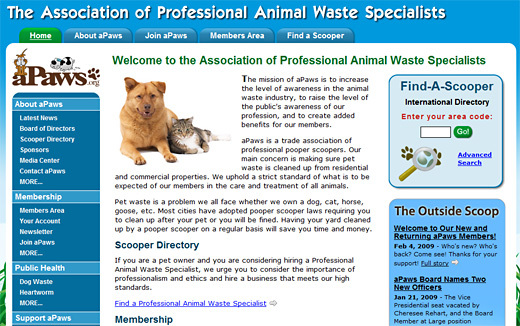 Their mission is to increase the level of awareness in the animal waste industry, to raise the level of the public's awareness of the "pooper scooper" profession, and to create added benefits for their membership. The organization wanted us to completely redesign their web site so that it would better showcase their mission, promote their professional image within the public health industry, and promote an increasing number of membership benefits. This was a fun site to build and we were very thankful to work with some of the nicest people we've ever done business with. Our design dilemma: how do you effectively design a web site for an organization where pet waste is their center of focus? Solution: We decided to use crisp blue and clean green colors. We put in a lot of grass, sky, and gradients. Well, go see for yourself. We wanted the web site to have a very clean look! 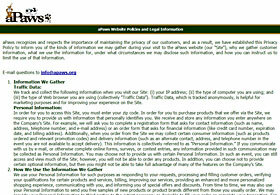 Here's a before and after image of their legal information home page. We choose a crisp blue sky, with a blue menu on the left side for the navigation. We also ensured that this web site is fully Web Standards compliant, as well as contains fast-loading pages. A two and three-column fixed, centered design was used and is controlled completely by strict CSS technology. All pages are automatically printer-friendly with no need to obtain a 'Printer-Friendly Version'. The entire web site was developed using the Microsoft .NET framework and utilizes the latest in page speed optimization. Expanded sections, information, and resources. 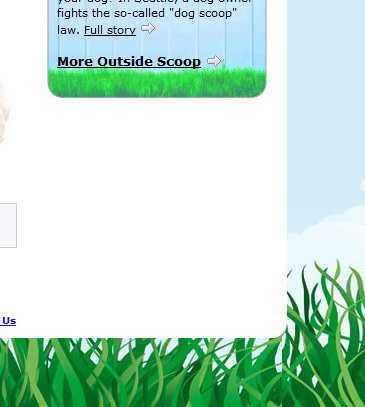 Improved Find-A-Scooper International Directory to find a pooper scooper. Easier access to both public and Members Area sections. Faster pages, streamlined navigation, and hundreds of improvements to the code. Site was written in standards-compliant XHTML 1.1 markup language. All presentation elements are controlled by CSS. Code is written to help conform to Section 508 guidelines. SQL Server 2005 used to manage all site database requirements. 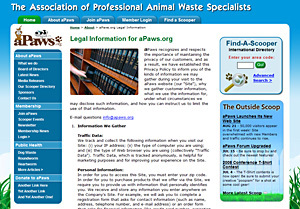 aPaws was our most fun web site to produce to date. And we learned more about "scooping" then we ever thought possible!